ORCHARD PARK, N.Y. (AP) — Jaguars cornerback Jalen Ramsey can criticize Buffalo rookie quarterback Josh Allen all he wants. The Bills aren’t taking the bait. Defensive tackle Kyle Williams shrugged. “I don’t care,” he said, when reminded of Ramsey calling Allen “trash,” and referring to the Bills’ decision to select him seventh overall as being “a stupid draft pick,” in a story published in GQ Magazine in August. 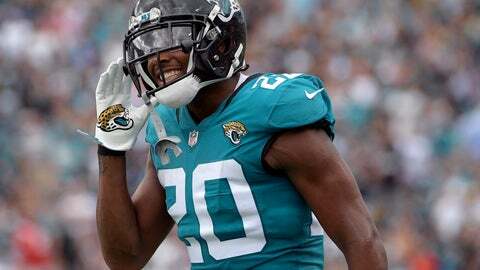 Ramsey didn’t back off this week, with Jacksonville preparing to play at Buffalo on Sunday, and Allen set to start after missing four games with a sprained right throwing elbow. Allen took the high road. In calling Ramsey “one of the best corners in the game,” Allen said the only way to deal with the comments was ignoring them. “We move on,” he said. Whatever bad blood the outspoken Ramsey might have been attempting to stir between two non-division rivals meeting for the 11th time in 13 years is being set aside in part due to the deep ruts both teams have dug for themselves. Some 11 months since the Jaguars defeated the Bills 10-3 in the AFC wild-card playoff, both teams are 3-7 and have been mostly undone by sputtering and turnover-prone offenses. The Bills taking a step back was expected despite ending a 17-year playoff drought. Buffalo is breaking in a new quarterback and had little money to spend this offseason to address needs on offense. Buffalo is at least rested, following its bye week off, and coming off a 41-10 win over the New York Jets in which journeyman Matt Barkley breathed life into an offense in his first start in nearly two years. The Jaguars, by comparison, have been a major disappointment a year after a 10-6 finish and losing the AFC Championship game to New England. They’ve dropped six straight and coming off a 20-16 loss to Pittsburgh, in which they squandered a 16-0 third-quarter lead. The offense has sputtered due to injuries and ineptness. And Jacksonville’s prized defense has been unable to carry the extra burden. Coach Doug Marrone refuses to lean on excuses. Marrone isn’t sure what reception he’ll get facing his former team at Orchard Park, New York, for the first time as a head coach. He went 15-17 in two seasons in Buffalo before opting out of his contract after a 9-7 finish in 2014. The opt-out option, including a $4 million payout, kicked in because of an ownership change once Terry and Kim Pegula bought the team after Ralph Wilson died. Allen reclaims the starting job because the Bills are placing an emphasis on having him gain as much on-field experience as possible to spur his development. The 22-year-old was inconsistent going 75 of 139 for 832 yards with two touchdowns and five interceptions in five-plus appearances. Allen still leads the team with three touchdown runs, though was knocked for being too quick to scramble out of the pocket. The Jaguars are 2-0 against rookie quarterbacks under Marrone. They handled Cleveland’s DeShone Kizer in 2017 and the Jets’ Sam Darnold earlier this season. Kizer threw for 179 yards, with a touchdown, two interceptions, two fumbles and five sacks. Darnold threw for 167 yards and a touchdown, and was sacked three times. The Jaguars are regaining their offensive identity with running back Leonard Fournette’s return after missing six of seven games with a strained right hamstring. He has combined for 148 yards rushing and two touchdowns, and 102 yards receiving and a TD the past two weeks. The Bills have allowed 223 yards rushing in their past three since giving up a season-worst 220 in a 37-5 loss at Indianapolis. The Jaguars have turned the ball over at least once in every game this season. They have 20 giveaways, including a league-worst 11 lost fumbles. Buffalo’s 22 giveaways and 16 interceptions are tied for the NFL’s second-worst totals.